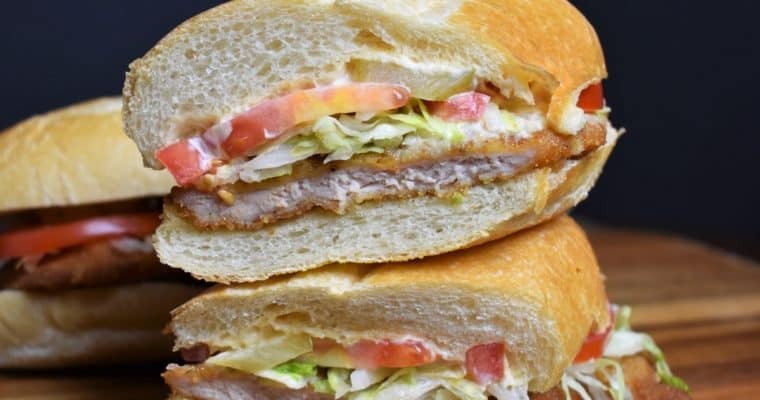 If you’re in the mood for a fantastic sandwich, this crispy chicken BLT will not disappoint. 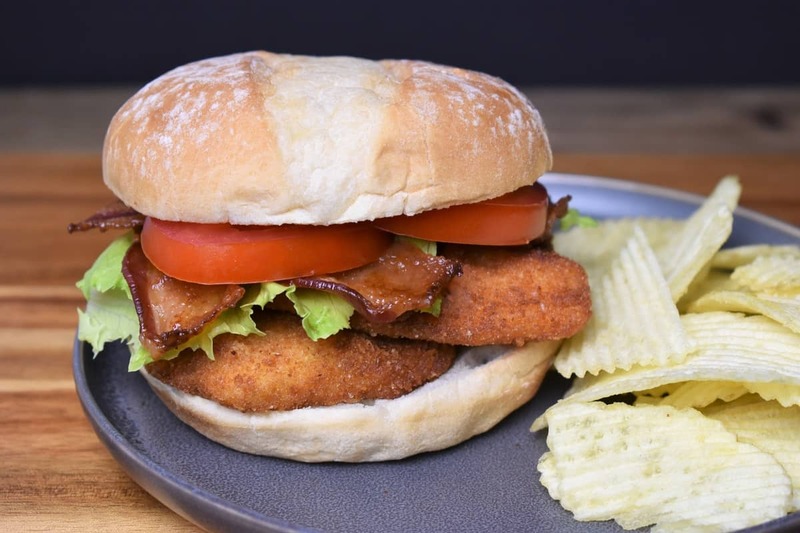 Take a crispy chicken sandwich and combine it with a classic BLT and you’ll get one delicious meal. 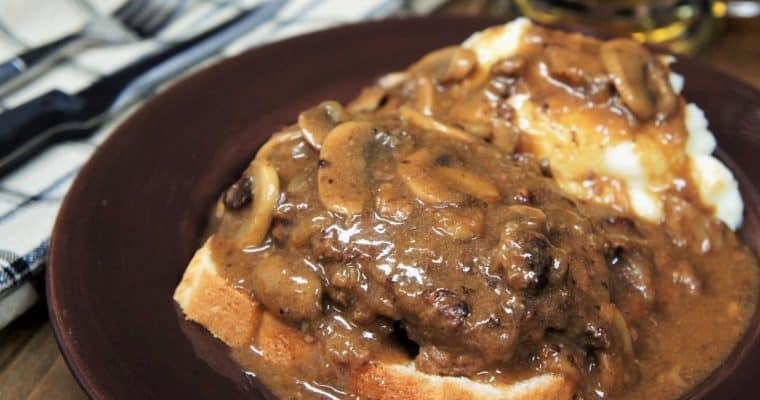 Take-out won’t stand a chance once your family gets a taste of this sandwich. Enjoy! If a recipe calls for several herbs and spices that will get added at the same time, I like to combine them ahead of time and make a seasoning mix. Making a seasoning mix really helps when you’re working on a recipe that moves quickly. Instead of standing over the pot measuring out a tablespoon of this and ¼ teaspoon of that, everything is ready to go. Just dump and stir. If you’re seasoning meat, this technique ensures the seasonings are evenly distributed. Combine the salt, garlic powder, onion powder and black pepper to a small bowl. Stir to combine. Cut each chicken breast in half lengthwise (like butterflying but go all the way through). Then, cut each piece in half to make 8 smaller pieces. Season the chicken with a little less than half of the prepared seasoning mix. Use a large sheet pan, or 2 pans or plates. Add the flour to one side and the breadcrumbs to the other. Add half the remaining seasoning mix to the flour, combine with a fork. Add the remaining seasoning mix to the breadcrumbs and stir. Scramble the eggs in a medium bowl. Use a bowl that large enough so the chicken fits comfortably. Lightly coat the chicken piece with the flour. Shake off the excess. Dip the chicken into the egg bowl, make sure the entire piece is moist. Next, place the chicken in the breadcrumbs, make sure it’s completely coated, and shake off the excess. Set on a pan or plate and repeat with the remaining chicken pieces. If you’re stacking the breaded chicken use parchment paper so the breading doesn’t stick to itself and flake off. Discard any leftover flour, breadcrumbs and egg. Get step by step dredging and breading instructions with pictures. Pour enough oil in a large heavy skillet to cover the entire bottom by about a ¼ inch. Heat the oil over medium-high heat. Make sure the oil is hot before adding in the chicken. Use a test piece to make sure the oil is hot enough. If it starts bubbling and makes a sizzle sound, it’s ready to go. If the oil is too hot the coating will brown too quickly and the chicken won’t cook all the way through. If this happens, lower the heat immediately and turn the chicken frequently. Just remember to raise the heat again if needed. If the oil is smoking, it’s too hot and you pretty much have to start over. Add about half of the chicken pieces to the skillet. Don’t overcrowd the skillet, fry the chicken in batches. Use tongs to turn the chicken so the coating doesn’t flake off. Fry the chicken for about 2 – 2½ minutes per side until golden brown. Remove the chicken from the skillet and place on a plate or pan. Fry the remaining chicken. It may be necessary to lower the heat a little bit for the second batch. Once the chicken is frying make sure they’re sizzling and the oil is bubbling, raise the heat again, if necessary. Make sure the internal temperature of the chicken reaches at least 165°F at the thickest part. 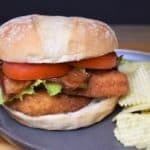 If you’re in the mood for a fantastic sandwich, this crispy chicken BLT will not disappoint. Combine the salt, garlic powder, onion powder and black pepper to a small bowl. Stir to combine. Cut each chicken breast in half lengthwise (like butterflying but go all the way through). Then, cut each piece in half to make 8 smaller pieces. Season the chicken with a little less than half of the prepared seasoning mix. Use a large sheet pan, or 2 pans or plates. Add the flour to one side and the breadcrumbs to the other. Add half the remaining seasoning mix to the flour, combine with a fork. Add the remaining seasoning mix to the breadcrumbs and stir. Scramble the eggs in a medium bowl. Use a bowl that large enough so the chicken fits comfortably. Next, place the chicken in the breadcrumbs, make sure it’s completely coated, and shake off the excess. Set on a pan or plate and repeat with the remaining chicken pieces. Add about half of the chicken pieces to the skillet. Fry the chicken for about 2 – 2½ minutes per side until golden brown. Build your crispy chicken BLT. 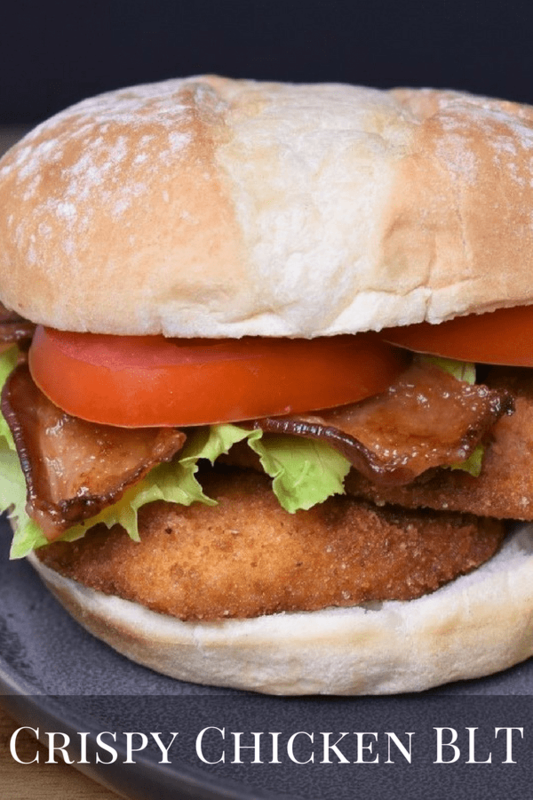 Add two pieces of chicken, 2 slices of bacon, lettuce and tomatoes to a bun, spread about ½ tbsp. of mayo.